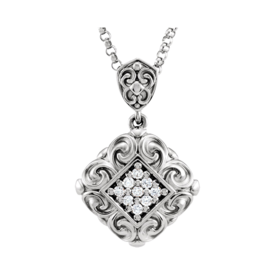 Pretty 14k White gold diamond necklace. 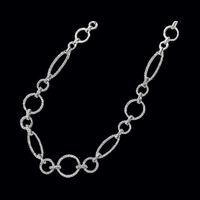 Diamond drop design features three circles each larger then the one before attached to a diamond by the yard style chain. Diamonds total .93ct tw in this lovely very stylish necklace. Diamonds are SI 1 G-H in color. Indulge yourself with this incredible diamond necklace or also makes a wonderful gift for a special lady. Intriguing 14k white gold diamond necklace. This old world sculptural design is a lovely piece of art. 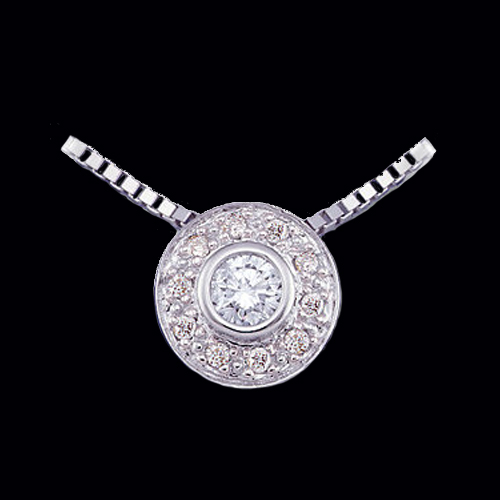 Round diamonds fill in the diamond shape center in this necklace and total 1/8ct tw. Necklace focal point measures 15.9mm wide by 24.6mm in length, a very nice size. Chain is an 18 inch Rolo chain. Like this style but prefer yellow gold? We're happy to make this in 14k White (shown), 14k Yellow gold, or 14k Rose gold. Also available as a pendant. Lovely 14k Yellow or White gold Fleur-de-Lis necklace set with black diamonds create this great design. Diamonds total 1/4 ctw and there are 47 of them. 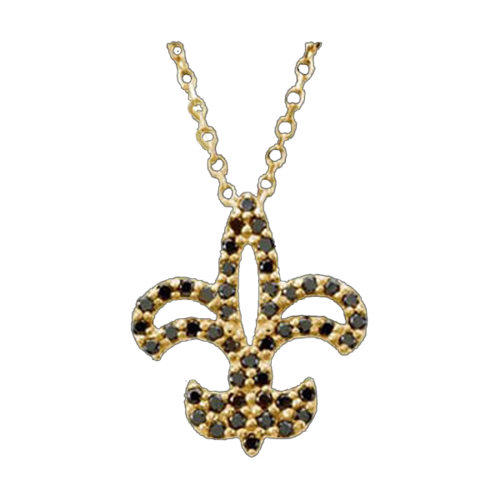 This Fleur-de-lis black diamond necklace is 16" in length and the 14k gold cable chain measures 1m in width. The matching earrings are also available, item #CE755-67. 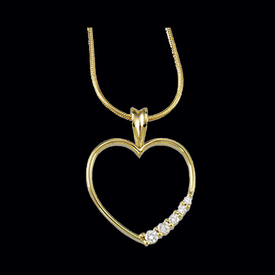 Graceful 14k two tone gold diamond necklace design. 14k Yellow gold links combine with 14k white gold diamond filled circles to create this incredible necklace. Diamonds total 5/8ct tw in this stylish diamond necklace. This necklace weighs 23grams. Diamond slide necklace. Pretty 14k white gold diamond slide is set with 1/6ct tw diamonds. 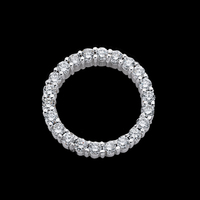 Center diamond is a 1/10 carat and surround like a halo with 10 accent diamonds. Necklace measures 18 inches in length. A pretty, very affordable diamond necklace. Stunning Diamond solitaire necklace. 14k white gold holds a 1/4ct round diamond which hands from a 14k white gold 1mm wheat chain. Diamond is an I1 clarity G-H color affordable diamond necklace. Necklace measures 18 inches in length and is secured with a lobster clap. A great diamond necklace. Lovely Blue and White diamond teardrop necklace. 14k White gold pendant is set with a beautiful blue and white diamond combination. Diamonds total 1/2 carat in this necklace. Necklace measures 18 inches in length. A great necklace for any occasion. 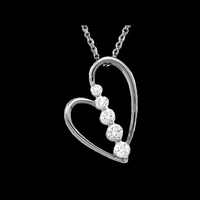 Beautiful 14k White gold diamond necklace. Diamonds total 1 1/2 carat total weight. Chain weighs 18.86grams. Just beautiful diamond necklace. This stunning diamond necklace measures 11.75mm in width and 16 inches in length. 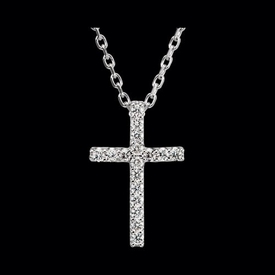 Platinum cross necklace. 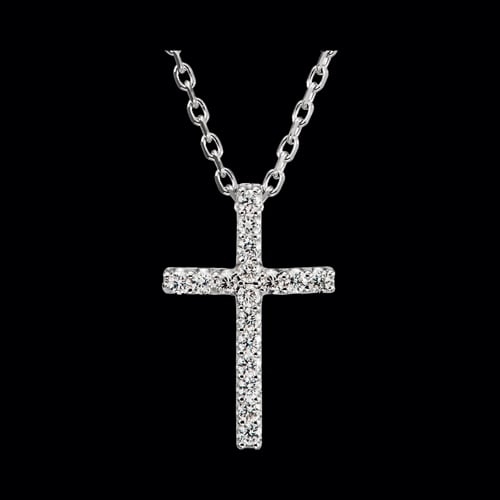 Adorable Platinum diamond cross hangs from a 16" Platinum cable chain. Diamonds in this cross are SI 1 clarity G-I color. This lovely platinum cross necklace will make a wonderful gift. 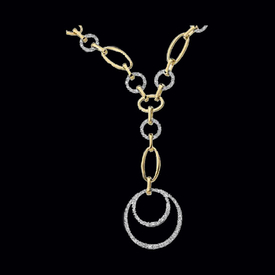 Beautiful 18k Yellow or White gold Diamond necklace. This great floral design is part of the New Journey collection. Diamonds are princess cut and total 1/2ctw. Necklace measures 16 inches in length. Pretty pendant hangs from a 2mm 18k gold wheat chain 16" in length. Love is a Journey that gets better with time. 14k White or Yellow gold 1/2ctw princess diamond necklace. Another fabulous part of the Journey collection. Journey represents Loves Journey that sweetens with time. A fantastic gift idea. Diamond Tennis Necklace. Beautiful 14k Gold "XO" Design graduated diamond necklace. Necklace holds 3.13 ctw SI 1 G-I diamonds. She will Love this Wonderful gift idea. White Gold or Platinum available email for pricing. 14K Gold Diamond Solitaire Necklace available in 1/10ct and 1/4ct tw. Great Diamond Necklace for jeans and a tee shirt or that elegant evening gown. Diamond solitaire slides on a 14k gold diamond cut snake chain 18 inches in length. 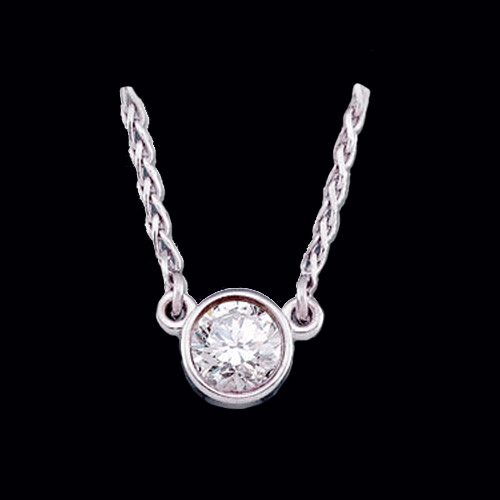 Diamond solitaire necklace is a classic, great gift idea. 14k White Gold Diamond horseshoe necklace is set with 40ctw diamonds. Horseshoe piece of this necklace measures 1/2 inch wide by 1/2 an inch in length. Vibrant necklace for everyday.